WOW! the last week of blocks is done and we are going to be starting to put our quilt top together this coming week. I just managed to squeak by and get my applique stars done just in time. These were fun, I tried to use every material design in a star block. I used the blanket stitch to sew the applique star onto the background which was pretty quick. The stars are so cute and small it only took about 10 minutes each to sew them. I used both the 5 point and the 4 point design to mix it up a bit. 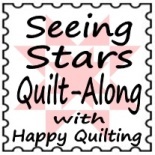 I love my stars and can’t wait to see the final quilt all together. It’s kind of sad to realize this quilt-a-long is almost done, I’ve enjoyed making these blocks each week but I’m also looking forward to having this quilt done as it’s the first Christmas quilt I’ve made and I hope to have it completely done so we can enjoy it this year. They look so awesome!!! I love how you mixed both kinds of stars!!!! And blanket stitch is my favorite as well. It is just so relaxing and fun to stitch around them. 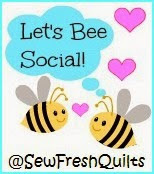 And I am with you, I am sad to see it coming to an end, but so excited to see everyone’s finished quilts!!! !